Being able to think up an idea and draw it into a 3D form seemed crazy years ago. 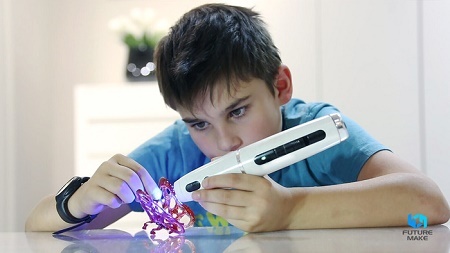 Pens like the 3Doodler coming onto the market changed all that, and plenty of different versions have popped up since then. As always, some are more successful than others. The only problem with these pens is that they use smelly plastic and heating elements that can get to such high temperatures that it could be dangerous for the user. This is especially the case if you let a little one play with it. If you like the idea of being able to bring your ideas to life, but don’t want any of these annoyances, then the Polyes Q1 will be your tool of choice. This uses photopolymers that will solidify immediately when exposed to the internal LED light. This has a built-in tilt sensor, to protect curious children from blinding themselves. There are many different types of ink, including versions that glow in the dark, are transparent, Eco-friendly, aromatic, and more. If this sounds like the perfect tool for a house full of creative minds, then you’ll be looking at $79 for the Polyes Q1 and three ink cartridges. If this sees much use you’ll have to buy more ink, which will cost more. One cartridge will last about 15-35 minutes of constant use, and the battery for the pen can last about 1.5 hours. It’s certainly more expensive than a box of crayons and coloring book.